Our range of cattle supplies covers everything from large troughs and feeders, to combs, clippers and parasite treatments. To maintain the good health of your livestock, our cattle supplies include effective supplements, and treatments for injection, pour on or drenching. Take the new Closamectin Pour On. A convenient 3 in 1 treatement for Fluke, Worms and lice in cattle. No longer do you have to drench or inject for control of fluke in your herd. Products such as these are incredibly effective against sucking and biting lice, eyeworms, lungworms liver fluke parasites. To protect your sheep and cattle, supplies from our online shop also include heavy duty foot baths. These reinforced plastic footbaths can hold 300 litres of solution. Suitable for copper sulphate, formalin, zinc or the new Kling-on Blue. Thanks to the sturdy, plastic construction, these rust proof foot baths can be stacked away conveniently in storage and will not corrode after chemical footbath use. Designed specifically for a consistent run of clipping of horses, cattle, sheep and dogs, the Lister Laser Clipper has really made its name in the field of agriculture. This clipper has become an essential among cattle supplies. This powerful 170 watt clipper has been built to be incredibly resilient, successfully tackling all manner of tasks. Just see our selection for a choice of clipper heads for different jobs. 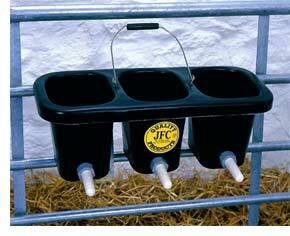 You will also find an excellent selection of feeders and troughs among our selection of cattle supplies. Available in various sizes, our range of Galvanised Drinking Troughs are built to last for years. These hard wearing drinking troughs have a rolled top and bracing for safety and stability and come in a vast range of sizes to suit types and numbers of livestock. There is a massive selection of cattle supplies from our online shop. We can help you find just the right items for the health and welfare of your livestock and horses. For the care of your animals inside and out, look no further than Farm & Country Supplies.